Kobe Bryant, bottom row left, attends the 90th Academy Awards Nominees Luncheon at The Beverly Hilton hotel on Monday, Feb. 5, 2018, in Beverly Hills, Calif. Retired basketball star Kobe Bryant made headlines last month with his very first Oscar nomination. Now, with his win tonight, he'll likely make a few more. 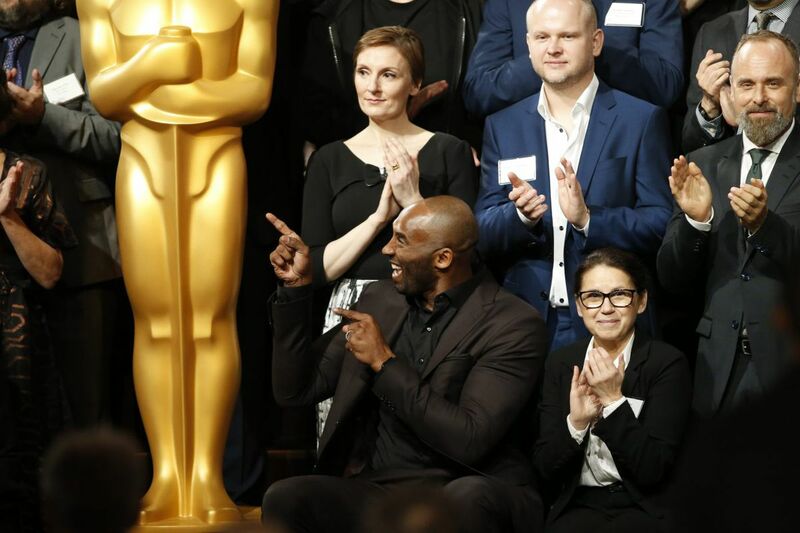 Bryant, a Wynnewood native who graduated from Lower Merion High, took home the Oscar for best animated short for Dear Basketball, a six-minute short dealing with his retirement from the NBA in 2016. Bryant wrote and narrated the short, which was directed by Glenn Keane, who is known for his work on Disney films, including The Little Mermaid, Beauty and the Beast, and Pocahontas. The short film is based on a 2015 letter by the same name Bryant wrote in the Players' Tribune, in which he announced that he would retire from basketball. A five-time NBA champ, Bryant played the entirety of his 20-year pro basketball career with the Los Angeles Lakers. Bryant is the first former NBA player to win an Academy Award. During his speech, Bryant took a shot at Fox News host Laura Ingraham who last month criticized LeBron James' political stance. Bryant said, "As basketball players, we're supposed to shut up and dribble but I'm glad we're doing much more than that." Former Sixer Charles Barkley similarly mocked Ingraham on Saturday Night Live last night. Bryant's nomination for Dear Basketball in January was a controversial moment in the Oscars race. It came about following the proliferation of the #MeToo movement, which focused attention on a 2003 sexual assault allegation against Bryant. In that case, a 19-year-old hotel employee in Colorado claimed Bryant had raped her. The case was settled in 2005. Dear Basketball was not nominated for any other Academy Awards this year. Last month, however the short film took home an Annie, an animation-specific award, for best animated short subject.